When you instruct a Solicitor or other lawyer and you place your trust and faith in them only to be let down it can cause a significant amount of distress and anxiety. If the Solicitor or other Lawyer has failed to deliver a reasonable standard of service and this has impacted upon your matter you will rightly feel aggrieved and you would be justified in raising a complaint with the firm. However as explained below it is very important that you realise that the resolution of a complaint or the acceptance of an award by the legal Ombudsman is likely to be legally binding and prevent you from bringing a subsequent professional negligence claim, even if you have suffered financial losses far in excess of what you will recover through your complaint or an award from the Legal Ombudsman. All legal firms and practitioners including Solicitors and Barristers are obliged to have an internal complaints procedure and if a formal complaint is raised with them they ought to respond to your complaint in accordance with their complaints procedure and provide a final response to your complaint within 8 weeks. Although you also have the right to refer your complaint to the Legal Ombudsman it is unlikely that the Legal Ombudsman will deal with the complaint unless the legal firm has been given the opportunity to respond within their own complaints procedure and provide a final response within 8 weeks. However, once you have a final response or 8 weeks have expired and you have not received one you should then be able to refer your complaint to the Legal Ombudsman. In these circumstances when a complaint is made the Solicitor or legal practitioner will usually respond in writing to your complaint and sometimes offer to resolve it. If it is accepted that the service provided by the legal practitioner has fallen short of the required standard often a small reduction in fees or a modest amount of compensation for distress will be offered to you. If this is not satisfactory and you refer the matter to the Legal Ombudsman they will carry out their own investigation and may seek to encourage the parties to negotiate a resolution to the complaint. If the Solicitor or firm complained about makes an offer which you refuse but the Conciliation Officer considers it to be reasonable it is likely that the Legal Ombudsman will close his investigation. If the matter cannot be resolved by negotiation the complaint will be referred for decision by the Ombudsman, usually but not always on the basis of a report prepared by the investigating caseworker. The Legal Ombudsman makes decisions and awards on the basis of what is reasonable and does not have to follow strict legal principles. This theoretically could result in an award of compensation far in excess of what could be recovered as a matter of law in the Courts, however, in practice substantial awards for financial losses are rarely made by the Legal Ombudsman and it is more likely that modest amounts in respect of distress and inconvenience will be awarded. The Courts do not often award damages for distress and inconvenience and will not do so for the distress caused by the problems of the legal process itself even if these are connected to the negligence of your lawyer. However, it is not possible to go to the Legal Ombudsman for an award for distress and inconvenience and then go on to sue in the Courts for your financial losses as any settlement or award through your complaint or determined by the Legal Ombudsman are considered to be legally binding and you cannot raise the same matters again in a second claim through the Courts. 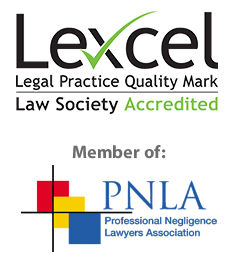 It is therefore very important to consider very carefully whether you have a valuable professional negligence case before you decide to accept any resolution to a complaint or an award by the Legal Ombudsman, to avoid losing your right to bring the professional negligence claim by accepting the resolution of your complaint. If you have or might have suffered significant financial losses, including any down value in your property, as a result of your Solicitor or other Lawyer’s negligence it is important that you have your case assessed by a specialist legal team experienced in professional negligence claims against Solicitors and other Lawyers.